As in the other Nordic countries, digitized picture books or enriched e-books are the most common form of electronic literature for children in Denmark. One of the largest publishing houses in Denmark, has a line of e-books called “Listen and Read” that presents itself to worried parents as being books “like in the good old days”. Examples of digitized picture books include Drengen der ville smage en kebab, Cirklen og andre cirkeldigte, Tak for halshugningen and Troldeliv. Denmark also has a number of innovative examples of digitally native literature that are created specifically for digital devices and that experiment with narrative forms and aesthetic strategies. Danish electronic literature for children is a creative meeting place for authors, illustrators, animators and designers of interaction, combining popular culture and the avante-garde. Rather than being an established commercial genre, this work largely depends on digital “con-amore” artists and often state-supported arts funding. Collaboration and the multimodal is so important that the Danish author Merete Pryds Helle suggests that literature in apps should be compared to drama rather than to novels: the production is as important as the letters on the page and cooperation between several fields of expertise is necessary. Most digitized and digitally native literature for children in Denmark is targeted to nursery and kindergarten children, and it often builds on already known characters and universes. These apps have more likely been produced by the marketing department than by editors and writers of children’s books, and the literary value is often found to be lacking. As a contrast to such commercial apps, you will find a few examples of apps demonstrating genuine narrativity and affinity to traditions of children’s literature and children’s fiction in general. This category includes varieties from remediated fairy tales of strong visuality and limited interaction (Charlies eventyr by Twopopes and Appmonk 2014) as well as stories without words but with voicing, animations and high interaction (They often prompt different reading methods, paths, and types of interaction. An example of high interaction and exploration of the physical room occurs in Wuwu & Co. Another example of high interaction is the app Hej min soI, where the child has to nod or shake his head to the camera to decide which way the story will go – with limitations. In Denmark electronic literature for children often operates between computer games and children’s stories and they pretend to be books as well as apps. They have a strong degree of multimodality and they integrate various art forms and sensory appeals, with strong visual, auditory, and tactile dimensions. Sofus og månemaskinen is an app that moves between the strong tradition of nonsense in children’s lyrics and the (animation) movie, between the narrative of a protagonist on a journey and the quest structure of the computer game, and between transparency and meta consciousness to the medium. In Sofus og Månemaskinen the reader has to collect things, shake a part of a sky rocket from a tree, light some candles, get Sofus through a labyrinth and so on in order to help Sofus save his planet. 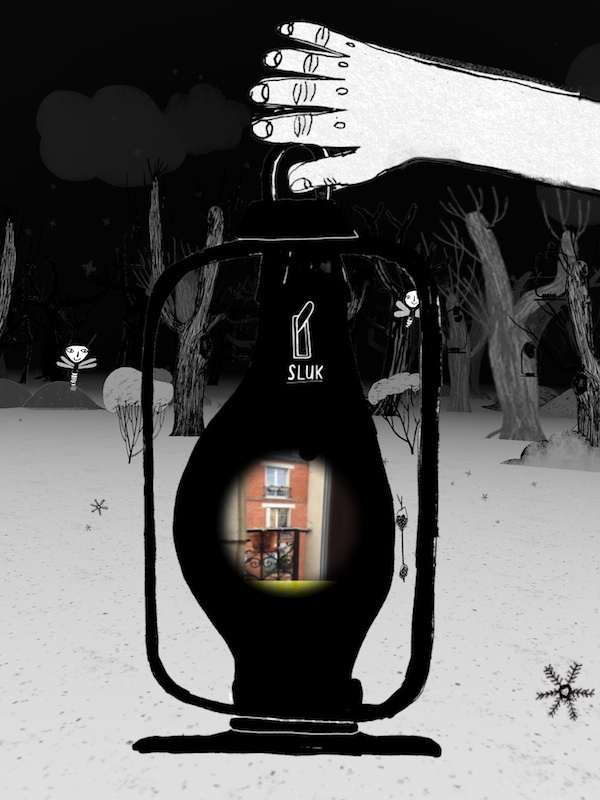 The app is about survival and existence, light and darkness, life and death. At a point there is a game sequence where the reader has to lose the game in order to continue. This is an ironic commentary on the game format, playing with the reader. It also illustrates the situation of electronic literature for children: it tries out different artistic strategies and tries to find or redefine itself as children’s literature. It reflects on itself and asks: what are the artistic modes of expression in electronic literature for children? What is the dialogue between children’s electronic literature and paper-based children’s literature, in particular picture books, and other media? One answer could be that experimental and unstable modes are the very characteristics of children’s electronic literature. Morten Dürr & Lars Gabel: Miki, Demibooks 2013. Merete Pryds Helle, Kamilla Slocinska, Tim Garbos & Aksel Køie. Wuwu & Co. Touchbooks 2014. Merete Pryds Helle, Malte Burup / Thomas Åkerlund: Hej min sol. Riktam Technologies 2015. Malte Burup, Kasper Sebastian Brandt Jensen, Pelle Skovmand & Mikkel Vedel: Sofus og månemaskinen. The Outer Zone 2015.